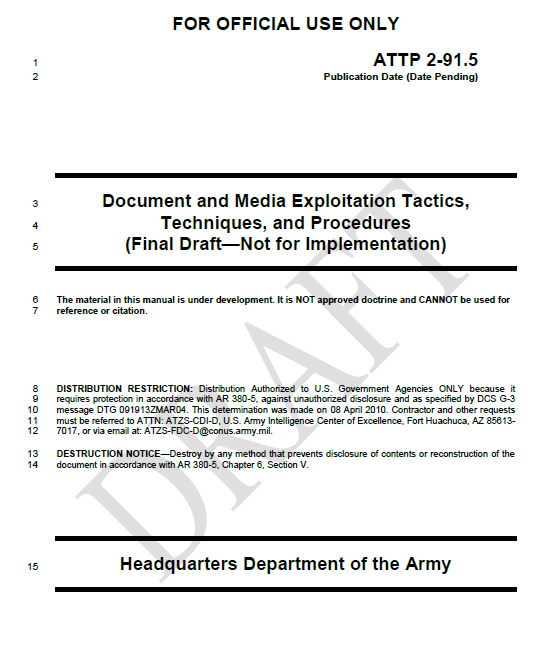 This publication provides Tactics, Techniques, and Procedures (TTP) required for Army personnel when conducting Document and Media Exploitation (DOMEX) operations. The document is designed to serve as a reference for multiple personnel at varying echelons. The ATTP provides specific information for Army personnel operating as part of a DOMEX or other exploitation team for the collection, processing, and reporting of DOMEX activities. The manual serves as a reference for staff planners and intelligence personnel at battalion and brigade combat teams. Additionally, the manual provides an understanding of DOMEX activities, procedures, organizations, products, and databases at joint task force, U.S. Army, and the Department of Defense. 1-2. DOMEX is the processing, translation, analysis, and dissemination of collected hardcopy documents and electronic media that are under the U.S. Government’s physical control and are not publicly available (training circular [TC] 2-91.8). 1-3. 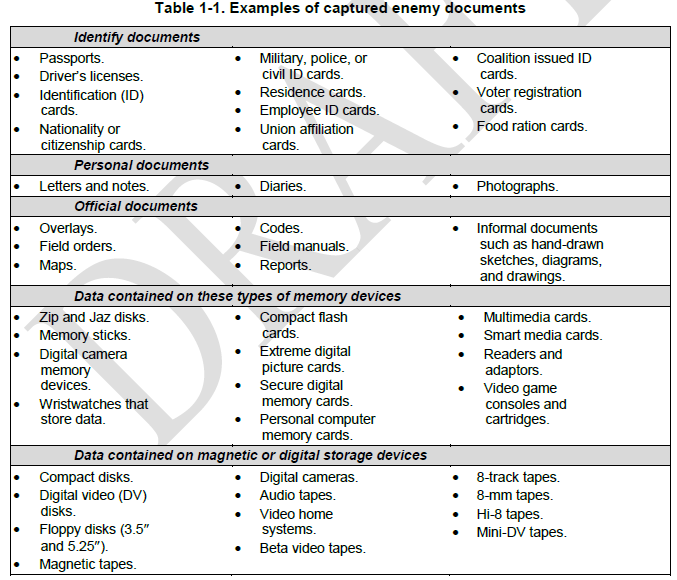 DOMEX includes the collection and exploitation of captured equipment, documents, and media to generate actionable intelligence. DOMEX provides leaders at all echelons with intelligence about enemy forces; their plans and intentions; and their TTP. It does this through the rapid and accurate extraction, exploitation, and analysis of acquired documents, cell phones, computers, digital storage devices, video and audio tapes, and other media and material. 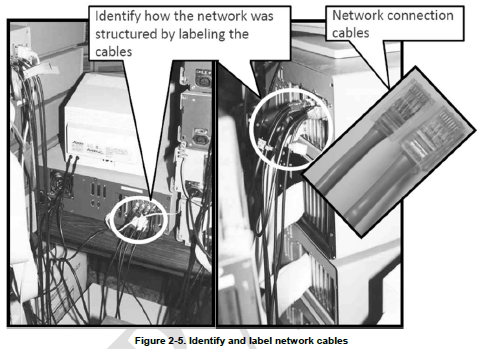 DOMEX is a critical part of target exploitation, especially as it relates to actions on the objective during site exploitation activities. Maximize the value of intelligence gained from captured materials. Provide commanders with timely and relevant intelligence to effectively enhance awareness of the enemies’ capabilities, operational structures, and intents. Provide timely and accurate intelligence support to the commander throughout the full spectrum of operations. Assist in criminal prosecution and legal processes by maintaining chain of custody procedures and preserving the evidentiary value of captured materials.